Move-in was great! There is much room for improvement as far a communication however. I think there was a slight disconnect with the RA's & the volunteers/ move-in coordinators. Many volunteers we're unsure what their roles we're and not much was explained when arriving to our site. We weren't trained on what to tell parents on parking and what parking options are for them nearby. There needed to be someone outside giving instruction for the student to go check in first while families & volunteers unload the cars. Many sites like Louisville hall were confusing to students as far as where to check-in and which side of the building to go to. Also, there should be a system for our international students moving in who are first-timers in the U.S. I ran into an international student from Japan who was lost near the Ville Grill who was trying to make it to Houchen's to retrieve his cardinal card. 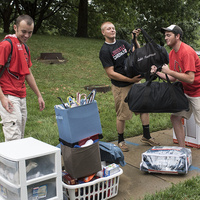 Maybe we can have students partner with them on their move-in day to act as an aid or tour guide. Next year should be much more informative, but this was definitely a great experience overall!